Heat the oil in a large flameproof pan and cook the onion and bacon for 2–3 minutes. Meanwhile, dust the chicken in the flour, shake off any excess, add to the pan, and cook for 5 minutes until golden brown. Add the wine and bubble vigorously for 5 minutes then add the mushrooms to the pan along with the hot stock. Cover and simmer gently for 10–15 minutes, or until the mushrooms are tender and the chicken is cooked through with no pink meat. 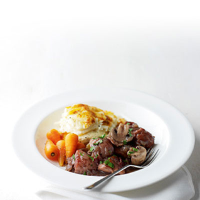 Sprinkle the coq au vin with a little chopped fresh parsley and serve with Waitrose As Good As Going Out Potato Dauphinoise and Chantenay Carrots.